The Floral Suitcase: new blogger blog hop! hello! i'm super excited to be part of the new bloggers blog hop hosted by the lovely beth from plum and june. there is a great bunch of bloggers and it's been fun getting to know everybody! i have been sewing and quilting for about, wow! 4 years, ever since the day i found out about bonnie and camille fabric *swoon* and i've been hooked ever since! i'm internet and book taught, i did go to a class at a quilt shop nearby but that's better not talked about! i love bright, fun fabrics! but i also love soft 'pretty' fabrics and quilts, i guess i'm still finding my 'style'. i blog about my current projects and fabrics and sometimes tilly (my dog) will pop up! 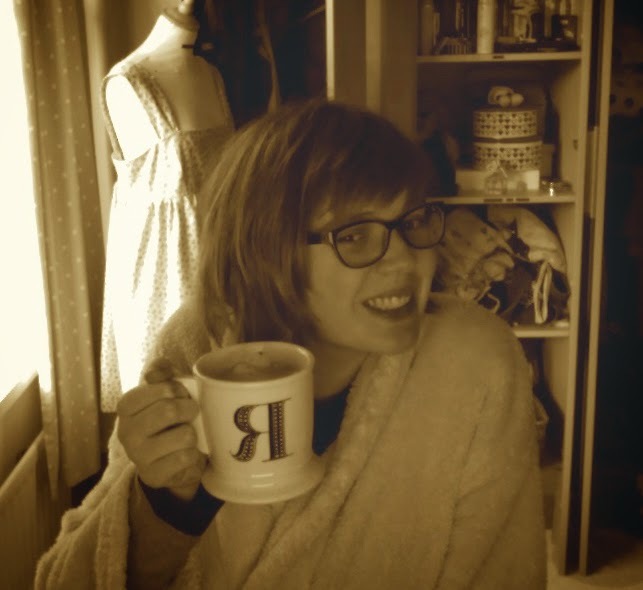 and here is my little blogging tip: just have fun! write what you want to write about and just have fun :) oh and a little quilting tip: if you haven't tried free motion quilting, you totally should because it's so ( i can't think of another word) fun! and really not as scary as you think! thank-you :) for visiting my blog! and guess what? there are lots more blog to visit today, yay! have fun! I recently had my first foray into free motion quilting, and you are so right! It was nerve-wracking indeed, but sooooo fun! I went a bit crazy, as you will see when you check out my let's get acquainted post, but I had a blast! I'm looking forward to my next fmq project! Now if only had I more than 20 minutes to sew each day! ok, where do you live so i can come over like tomorrow?! first and foremost, i have to have one of those badger cushions!! i don't think i can go on living life without one! second of all, i want those fabric bins, one in every color, to organize scraps in my craft room. lol. ok sorry, i just had starbucks and i got a little bit too excited there for a minute lol. i really wish i could do free motion! i tried, but it was pretty unsuccessful :'( anywho, it was very nice to meet you and i hope you'll stop by! I like bold fabrics, and soft pretty fabrics. There is nothing wrong with a variety. Your cushions and appliqué are adorable. Hello my dear! I too love the scrappy trip you made. I made one as well and love it! Beautiful projects. I really need to try me some of that sketchy applique! Adorable!! Oh, I love your sketch-y applique, too! It's nice to meet you, Rachael. I want to steal your badger cushion! How adorable! I am looking forward to seeing your butterflies completed! Hi Rachael! I love your projects! I love to applique, but I do it all by hand. Your machine-applique looks amazing. It's so nice to get to know you a little better. Can't wait to see what you have to share in the future! I'm right there with you. 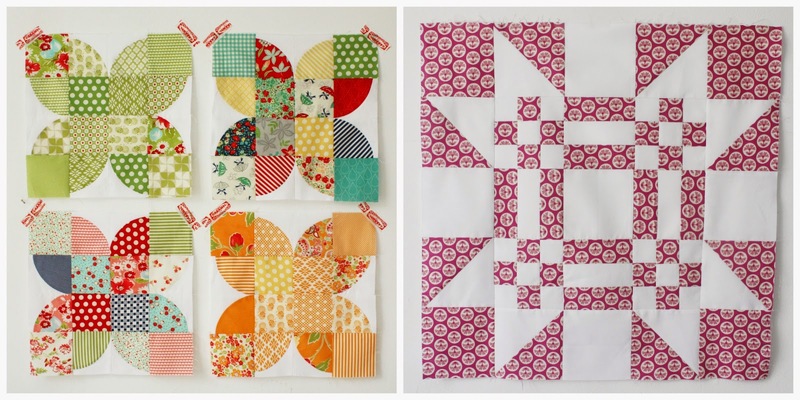 I fell in love with quilting when I discovered Bonnie and Camille fabrics. Your sketchy appliqué is really fun. I might have to try that. I definitely enjoy drawing that way, but I've never tried free motion quilting like it before. And those bins are adorable, looking forward to the tutorial. Beautiful finishes and I'm with Marcia, I cannot wait to see your butterflies completed! Totally agree with you about FMQ! Love it and practice does truly make the difference. 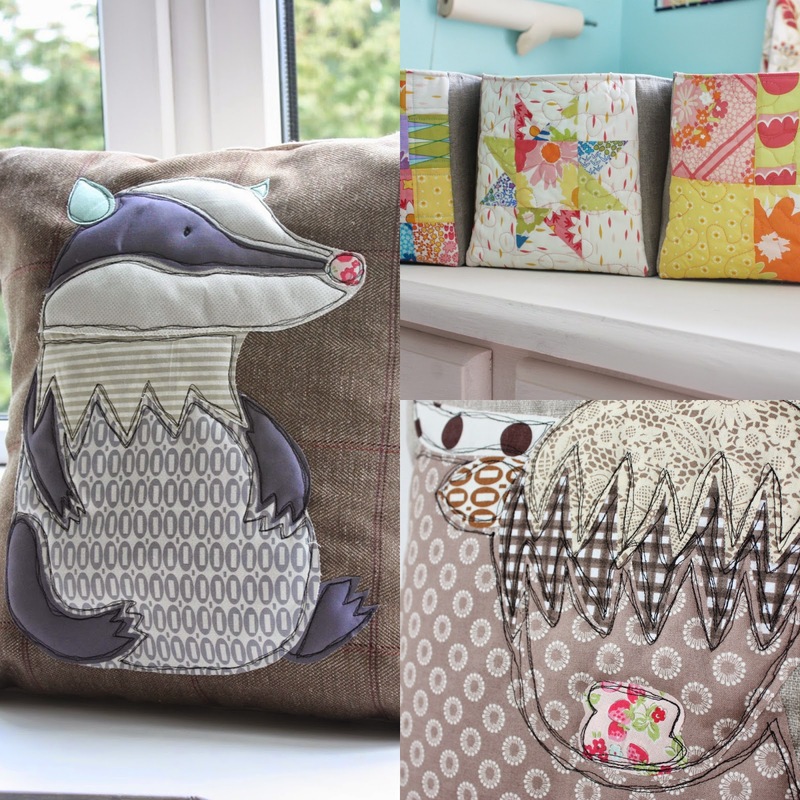 Love your cushions - that sketch stich is gorgeous especially the badger! You make beautiful things but you just shine with your appliqué. I always love it. Rachel, your retro butterflies are so cool! I haven't seen that pattern before....I can't wait to see the entire quilt. I ADORE the badger pillow! How fun! I love the strips of blue in your ferry floor quilt. They really make the whole quilt pop! 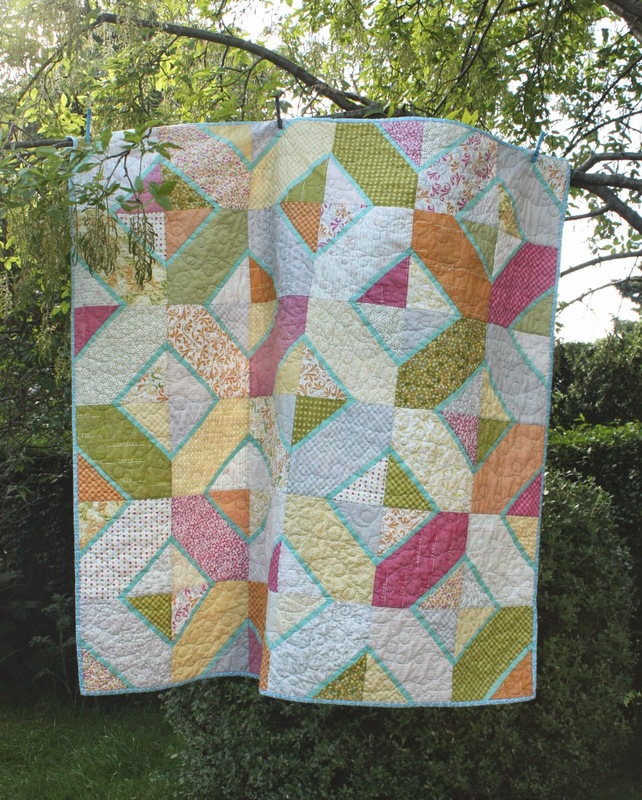 I agree about the fmq - it's one of the most fun parts of quilting! Those pillows are just too cute! I am so excited to see the process for sketchy applique... Its entirely way cute for the ones you have shown and I am interested in learning the process! I am about to venture for free motion quilting in a few weeks and I am pretty excited! The sketchy appliqué thingy is soooooo on my to-do-list! I thought I couldn't love anything more than your cow, and then I saw badger. My dad bought me a badger toy when I was a kid. 'What shall I call it?' I asked. 'I don't know. You can call it bloody Fred for all I care', replied Dad. I still have Fred the badger. Beautiful sketch applique! Great examples of your work, nice introduction! I love the retro butterflies! How long did each block take? I love your ferry floor quilt too! Beautiful! You have an amazing sense of color. 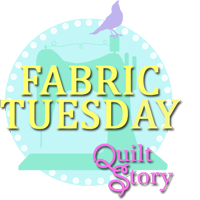 I love your quit selections for this blog hop. Thank you for sharing. I agree, my favorite fabrics change all the time. I love your quilts, and can't wait to see your butterfly quilt all finished. Lovely quilts, both the bright and the softer. Hard to have a style if it stops you making one or the other! But the badger applique has to be my favourite! I really enjoy smaller and different projects too, and I love applique, in and out of quilts. As much as I love quilts I think I'd get fed up just sticking to them. We just learned sketch stitch at a guild meeting last week, but yours are far better than anything I've come up with yet! I love that you don't type with capitals -- my husband randomly capitalizes words for no reason except he wants to, and I've always wished I had that kind of rebellion in me, but, alas, I'm too much of a goody two shoes. :D I think I might have to make a scrappy trip along, yours is gorgeous!!! Your scrappy trip around the world is beautiful! 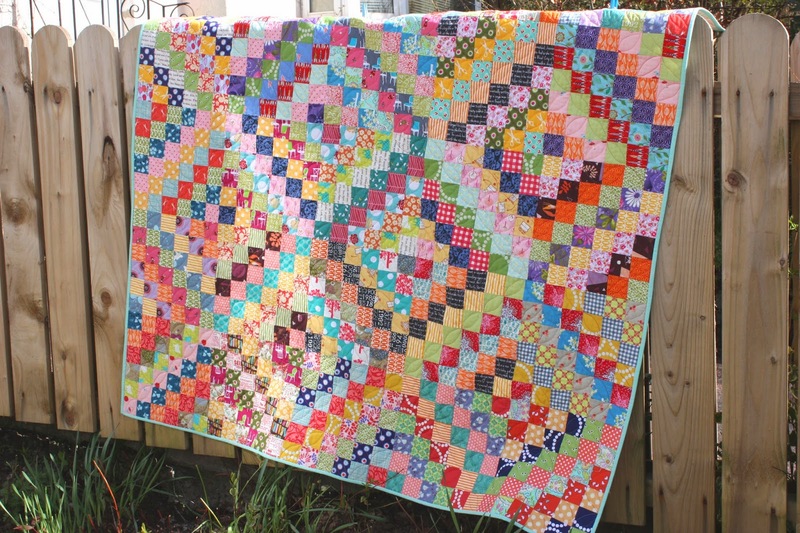 Your projects and quilts are gorgeous! I don't do appliqué, but you sketch-y appliqué is wonderful. I might have to give that a try. Thanks for the inspiration and happy quilting! Okay, I have to know: what went so wrong in the quilt class that we can't talk about (can we please talk about it?!)? well now you've got me intrigued - I want to know what happened at the quilting class! Like others have said - spill it! What happened at the quilting class?! Great post, looking forward to seeing more and I love your retro butterflies! Nice to meet you! Your cushions really caught my eye, lovely and fun! Enjoy the hop! Badger? That is too cute. I would love to make at least 27 of those, I have never tried applique, but that might be the motivation I've been searching for. Also, thanks for the FMQ tip--like everyone else, I'm terrified of it, and I have never tried it. My summer goal is to learn how. Thanks for sharing, Rachael! Love your projects - and you remind me of my sister not using capital letters! I love the name of your blog, your masthead and your quilts. Your colorful quilts are what I gravitate to. I participated in the hop last week. I'm glad I stopped by to visit. Cute stuff, lady! And you are totally right about FMQ. It's really is so much easier than we expect. Nice to meet you! I love your quilts! I can almost feel how soft they are. Fun projects! I love bright colors, too.